Turkey Rhubarb, Rheum palmatum, is sometimes known as Chinese Rhubarb. 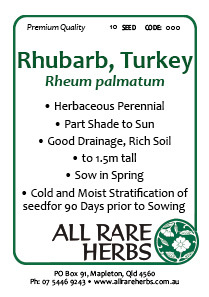 Turkey Rhubarb may be used in the same manner as Garden Rhubarb, but is also an ingredient in Essiac mixture. Turkey Rhubarb is a native of south east Asia, China and Tibet. Prefers rich, moist, well drained soils in a protected, partially shaded position. Frost resistant but drought tender. A perennial plant, growing to a height of 3m x 1.5m. Be the first to review “Rhubarb, Turkey, seed” Click here to cancel reply.